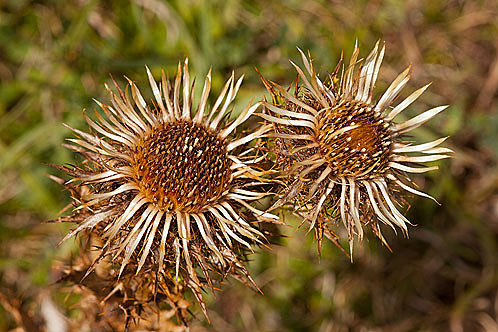 The Carline Thistle is a spiny biennial plant that can be found on dry, chalk grassland. The composite flower heads consists of brown florets (tiny flowers) surrounded by a fringe of golden bracts (leaf-like structures). Its distinctive brown and golden flower heads look look like dead or dying daisies , but they are in fact, in full flower - July to September. The dead heads persist for much longer, often into the following spring. Habitat is sand-dunes, dry pastures .